Here is something to cheer you up on a Friday - not that you would need much cheering up on the weekend! Thanks to Franky, I discovered a (scientific?) 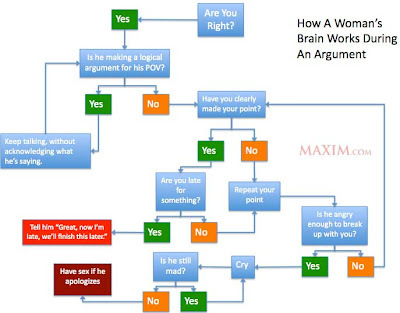 flowchart of how the brains of men and women work differently during an argument. The original pictures come from Maxim. Bottom line? 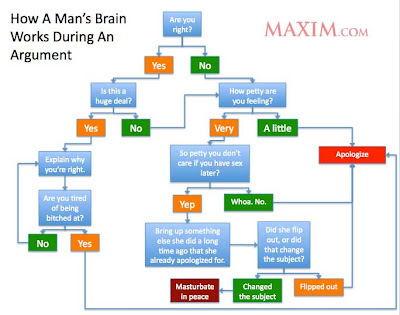 Men, spare yourself (and your partner) the hassle. When an argument starts, just APOLOGIZE. Be nice and sweet, and do what is being asked of you. My husband learned this lesson long ago and is why we are still happily together 30+ years later.